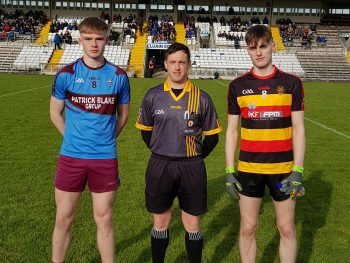 ST MICHAEL’S Enniskillen defeated Abbey CBS in their group game in Clones in November by a whopping 4-14 to 0-8, but at the same venue on Saturday Dominic Corrigan was happy enough to see his side through to the semi-finals by a margin of a single point. “Abbey really put it up to us from the start with that (Eoin Carr) goal after four minutes and there were a couple of times during the second half we got four clear of them and they still came back at us. “Indeed they could well have snatched a draw and I don’t think too many would have begrudged them it either. It was indeed a tough afternoon for the Kinawley man and his charges. Despite opening with a fine point from Ronan McHugh after 45 seconds, they were rocked by a goal in the 4th minute when Eoin Carr stabbed home a ball that John McGovern fumbled into his path. It took 16 minutes before Mícheál Glynn posted a free that put St Michael’s on parity at 1-1 to 0-4 and, after John McGovern and Glynn had traded points, Caolan Duffy picked off a neat point to give the Erne lads a 0-6 to 1-2 interval lead. The teams had two points each during the opening ten minutes of the second half, before St Michael’s opened a significant gap with two quick scores from Conor Love and a free from Darragh McBrien. However Abbey responded with four pointed frees, three for substitute Niall Toner and the other from a Jamie Martin 45 as time closed in on the game. Garrett Cavanagh then got up to support the Enniskillen attack, but seemed to have run out of space on the left wing before improvising and hooking over a point. With Glynn adding a free, St Michael’s had survived and not even a fifth free from Toner could rescue Abbey. St Michael’s Enniskillen: S McNally, D McBrien (0-2, 0-1 free), G Cavanagh (0-1), J Horan, A Ó Catháin, J Largo-Ellis, R McHugh (0-1), B Horan (0-1), J McDade, C Duffy (0-1), M Glynn (0-5 frees), G Quigley, P McKervey, C Love (0-2), T Keenan. Subs : M O’Shea for D Kelly (26), N Toner (0-5 frees) for P Loughran (HT), R McCarthy for S Campbell (36), D Malley for J Lynch (44), U Ó Coigligh for E Murdock (57).